Ecological succession is the sequential replacement process whereby ecosystem or habitat changes are either progressive, regressive or ‘to and fro’. The first is an advance from a simple habitat, such as a grassland, into a more complex one such as a woodland or forest. The second is when a more complex system reverses towards an earlier simpler seral stage (such as weed or shrub pioneers) as a result of disturbance influences. A third kind of succession is typified by the fire-induced ‘to and fro’ shifting sequences in wooded grasslands. 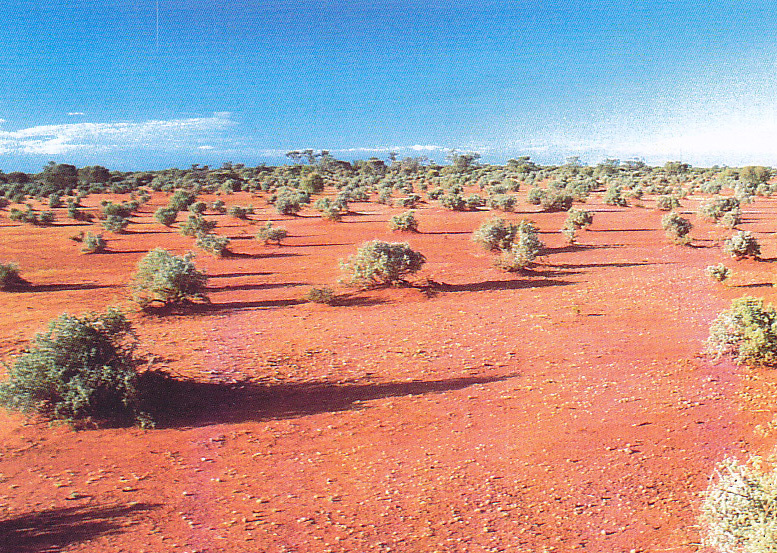 In the aridlands a sequence of exceptional high rain years can result in dense growth of scrub or trees, with rank grasslands. A following drought can result in the death of the denser patches, opening up the cover again and allowing expansion of grass cover possibly aided by the occurrence of intense fires. If followed by heavy stock grazing this can turn the balance back again towards scrub. The factors affecting successional shifts include: soil moisture, erosion, fire, plant colonisation and maturation, floods, droughts and animal influences (grazing/browsing, seed dispersal, animal irruptions eg. locusts, rabbits). Often overlooked in conservation is that geomorphic processes orchestrate landscape function and this is a determinant of biodiversity patterns, structure and composition (Tinley 1977; Pickup 1985; Smith et al. 1993). Four main examples of geoecological factors are: erosion,overgrazing/overbrowsing, fire, berry-bird mediated bushclumps. Change can occur in situ without any outside influences. For example, merely the growth maturation of plants can result in a dense canopy of increased shade that in time excludes light demanding plants and animals. This favours the shade tolerant plants thereby changing the structure and composition of the habitat. Heavy grazing/browsing has reduced this chenopod community to bare ground and one species. 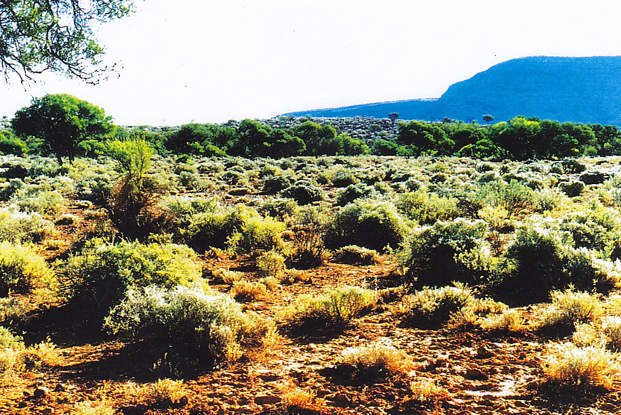 Light herbivore influence on the same chenopod shrubland; twelve species of saltbush and other plants with associated fauna. Ecojunctions are places where the largest number of landsystems and ecosystems meet and hence are of potentially greatest diversity representative of an area at all scales. Using the overlay technique on landsystem maps, the core areas of highest diversity for a station can be identified by finding where the largest number of landsystems abut in a 5km radius or 10 x 10 km size area. As much stock and game production country is part of the matrix of wild lands (either proclaimed as nature conservation areas or not) the establishment of 10 x 10 km benchmark areas (preferably fenced) that contain the ecojunction nodes of highest diversity would help realize (a) a management yardstick for the station or ranch, (b) the establishment of an archipelago of stepping stone natural systems interlinked by drainage, ridges or scarp lines. 2017 Art from EMU. Reconnecting habitats and biodiversity in the South West of WA. 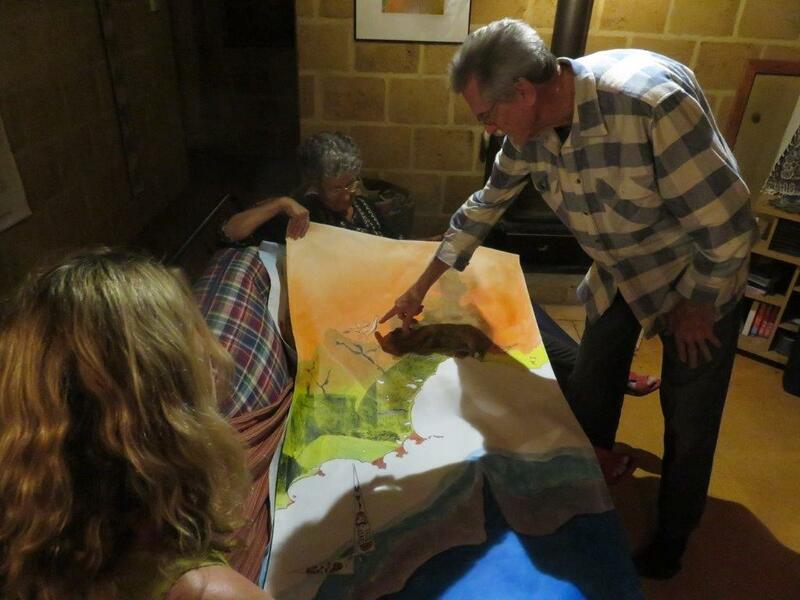 Ken and Lynne explaining to a group how they have created this large (3m x 1.5m) map/painting titled Reconnecting Country: Restoring Habitats and Biodiversity in the lower South West of WA. In the photo on the right this triptych is hanging in the Albany Musuem, WA. 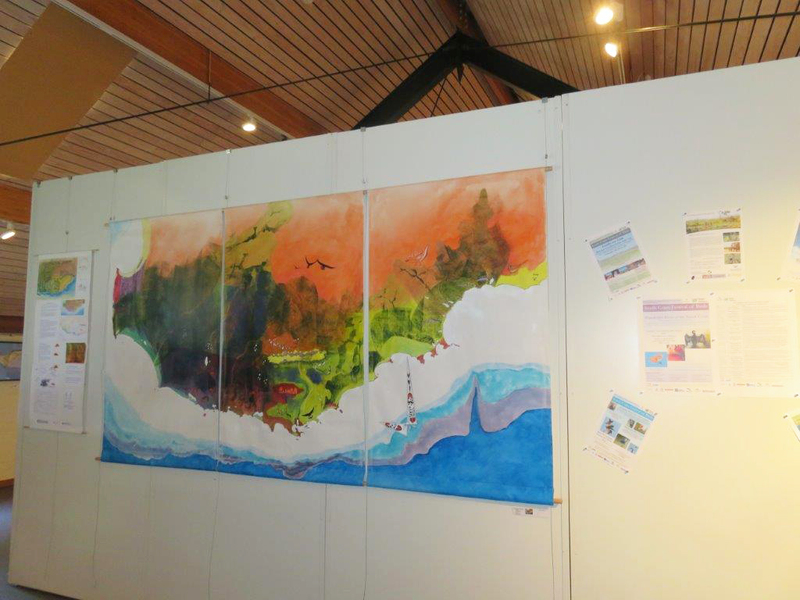 As in an EMU analysis of a landscape this painting was looked at first in layers - as in overlays. The geology was painted in first, then the drainage and drainage basins, and lastly the vegetation - with the addition of some iconic birds and animals that are rare and endangered.